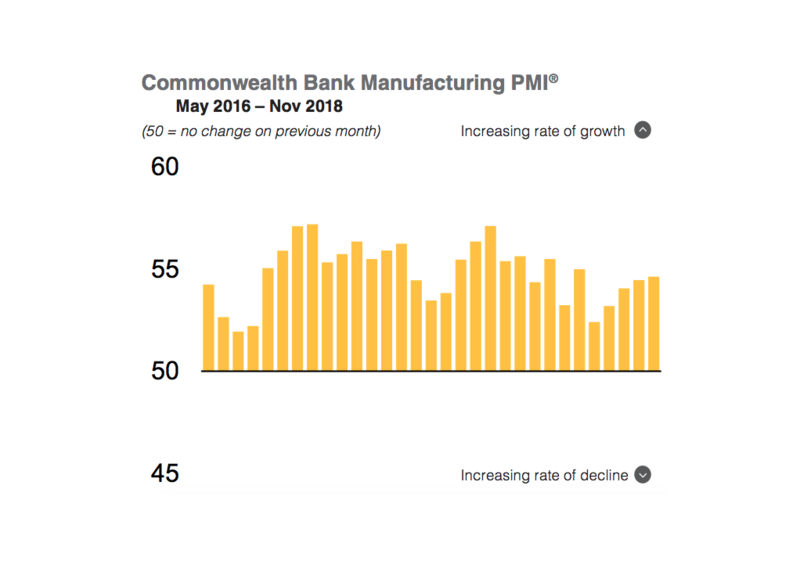 The CBA Manufacturing PMI rose from 54.5 in October to 54.6 in November, signalling another strong improvement in the health of the Australian goods producing sector. Output in Australia’s manufacturing sector continued to increase midway through the fourth quarter on the back of grater client demand and efforts to build-up inventories. Australian manufacturers also reported a further increase in new order inflows during November, with the pace of expansion picking up notably and being marked overall. The survey points to a number of factors contributing to higher sales, including greater demand, promotional activity, new client wins and higher overseas orders. “The expansion in overseas sales was the fastest for three months, with anecdotal evidence suggesting that both a more competitive exchange rate and expansion into new markets contributed to the increase,” reads CBA’s report. The survey also found that greater production requirements and higher sales motivated firms to expand operating capacities and build-up inventories. Factory employment rose further and at the quickest rate for five months amid another rise in backlogs. “In line with increased sales, November data signalled higher pressure on operating capacities across the Australian manufacturing economy,” it says in the report. According to the report, Australian manufacturers continue to face sharp cost increases, with inflation remaining well above its historical average. This prompted firms to raise output prices further, although the latest increase was mild compared to recent months. “Australian manufacturers raised prices charged for their products again midway through the fourth quarter,” it says in the report. The survey concludes that confidence in the manufacturing sector remains upbeat even though the Future Output Index hit its lowest level in nearly two-and-a-half years in November. Confidence among Australian manufacturers remained solid in November, as indicated by the Future Output Index scoring well above the neutral 50.0 level,” reads CBA’s report.